A single father who yearns to be a family man, Logan O’Donnell is determined to create the perfect Christmas for his son, Charlie. 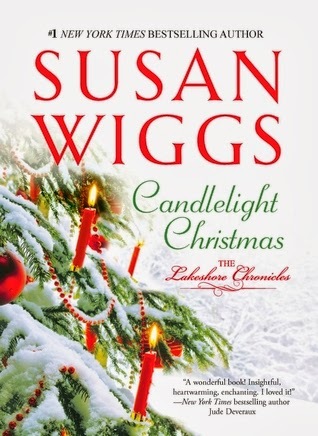 The entire O’Donnell family arrives to spend the holidays in Avalon, a pretty post-card town on the shores of Willow Lake, a place for the family to reconnect and rediscover the special gifts of the season. This is number ten in the Lakeshore Chronicles and I am always ready to return to Willow Lake and the many wonderful characters there. I was really delighted to meet Charlie again – now ten years old and his Dad, Logan. Logan and Daisy are the parents of Charlie although there relationship was not to be. Daisy chose the right man for her! However Logan deserves to have his story and find that love that lasts a lifetime. I liked that this story was told alternatively from the point of view of Logan, Darcy and at times Charlie. I know that some readers don’t like children in a book, but I do, and Charlie’s parts were just so heartwarming. Logan makes a great Dad for Charlie, and this book explores fatherhood a little, looking at the relationship of Logan with his Dad as well. It shows us two children who have no Dad at all – a druggie and no hoper. Logan reaches out to these children as well. I am hoping for another Lakeshore book in the future that includes Maya and her children Andre and Angelica. I am sure there are a few possible Bellamy’s available! This is definitely a Christmas book. While it begins in the summer, the main chunk of the book is set in the holiday Christmas season. It will touch your heart, and remind you about the real spirit of Christmas, where there is family, thoughtfulness, seeking to make others happy and real love. And as we all know not everything turns out perfect because it happens to be Christmas – well there is a touch of the imperfect too for these characters. However what really matters is totally there. I know all Lakeshore Chronicles readers will love this addition. Don’t feel turned away if you haven’t read the previous ones, but want a great Christmas season story – this book delivers. It could stand alone.